Armour boats have figured largely in our researches. Tom Armour (Uncle Tom) lent us the cuttings he had accumulated over many years so we have been able to build up a record of some of them. The Armours came from the banks from the Clyde before they went to Londonderry, Ireland, in the early 19th century. Before the 'new' town was planned and built on the sand-dunes where the River Wyre flowed into Morecambe Bay and the Irish Sea, there was little but the odd farm, a few cottages and a rabbit warren that was known as a good place to hide if escaping from the law! The river provided a good sheltered harbour for fishing boats and Isle of Man and Irish packet boats and was constructed on a revolutionary grid pattern by Sir Peter Hesketh Fleetwood who gave his name to the town. 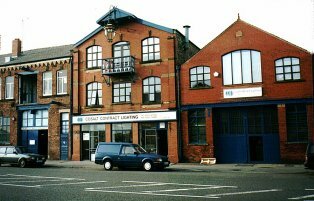 The Fleetwood Fishing company was founded in 1841. All kinds of boats were soon in great demand, trawlers, shrimpers, pilot boats and then luxury yachts for the successful. By the end of the century Fleetwood was the largest fishing port in the north-west, and ranked third in importance in Britain. James Armour - referred to here as James(1) - married Ann in 1838. He was a blacksmith by trade. Four of his eleven children were born in Derry, then his 5th child, David, was born in Fleetwood in December 1847. James(1), who died on 24 Jan 1875, was not the founder of the boatbuilding firm, nor his eldest son John, an engineer, who had died before him, in 1868, being drowned at sea. The inscription over the workshop on Dock St as shown by Catherine Rothwell in her book, Fleetwood as it was, (Henderson, publ. Hendon Mill, Nelson) includes at the top: ESTABLISHED 1880. By this time James(1) had been dead five years, so it must be James(2) (1845-1910). All three surviving sons, John, James(3) and Joseph, were eventually involved in 'J.Armour & Sons' and then as 'Armour Bros.' Joseph, whose name is over the shop door in the photo, mainly ran the chandlers shop. A more modern (1988) photo can be seen below, but this building has now been demolished and replaced by a supermarket. 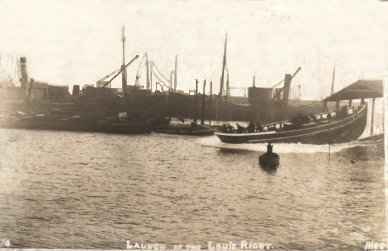 Their building shed was on Wyre Dock, near to the old slipway which is shown in the rather fuzzy photo of the launch of the Louie Rigby below. John, the eldest son, died in 1908 and his father, James(2) in 1910. 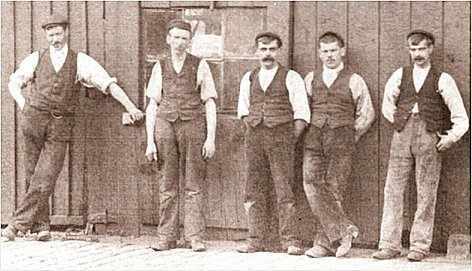 James(3) and Joseph continued in business for many more years, and lived on till the middle of the 20th century. 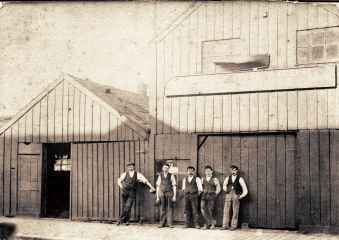 The work force for J.Armour & Sons outside the original, timber-built workshop. James Armour(2) married Elizabeth Gill on 2 Jan 1868. They had four children but one died in infancy, leaving three sons, (the 'Armour Bros') John, born 29 Dec 1868, James (3), born 13 Aug 1873, and Joseph born on 6 Mar 1879. James(3) kept a day book in which he recorded family events, including the day he started his apprenticeship. Armours began building boats in 1880, at first mostly fishing smacks and prawners of a traditional design for local use. It is not always clear from the various sources which firm, Gibsons or Armours, built which boats, so all boats mentioned in the text here are listed in a separate section below with information on each. Some of the information is repeated for convenience. Further links to this section are provided in the text so that they can be referred to again. 'Return' is to this point. Alan Lockett describes Stoba as follows: He was exact and temperamental, and if he did not get what he wanted he went home, as he did on the day a lad brought him galvanised nails when he had ordered copper. On being told there were no copper nails in store he reached for his hat and coat, saying he might as well go home. there was no point in staying with no work to do. And he couldn't work without the right materials...An apprentice caught sharpening a pencil with a knife would receive a shark crack over the knuckles from Stoba. 'What's your chisel for?' he would bark. One of James(3)'s daughters remembered her father lamenting that "Stoba would be the ruin of them all," with his demands for tropical hardwoods and expensive fittings. He was a perfectionist and he thought it wasn't his business to worry how much things cost! Stoba’s boats became famous for their speed and many of them still survive. 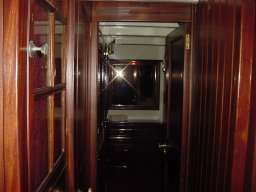 The boats were also renowned for the quality of the craftsmanship and for the beautiful wood used in them. Stoba himself had begun his apprenticeship as a shipwright at 14, working first for J.Gibson and Son, boatbuilders, later Liver and Wildy. Boats on which he worked were Zarah, Zulu (1901), May Marie, Reliance (1903), Capella, Togo and Tessa. Two launched well after Stoba joined Armour Bros. were Surprise (1908) and Minoroo (1909). Reliance, a ketch or Brixham trawler, built by Gibsons, was broken up on Oulton Broad in 1932. Further information on these or on any in the list below would be very welcome. The first owner was Henry Calvert, a textile magnate. His skipper, Captain Bob Rawlinson contrived to stay in charge during WW1 by becoming a lieutenant in the RNVR and worked the yacht in the Mersey, towing heavy barges and loaded deeper into the water. She also had a spell as a mine-sweeper. After much neglect during the war she was restored, then after the death of Henry Calvert, Mr Rawlinson bought her himself. The Mauna Loa was sold again in 1923, since when she has had a number of owners including the Marquis of Anglesey. For most of her ninety-plus years she has sailed round Tenerife, Gibraltar and the Mediterranean and is now registered on Guernsey. Seen here at Fleetwood on July 10th 2001, she had just arrived from Majorca. She has recently changed hands again and is now owned by the Duke of Westminster. Armour Bros' building shed was near the old slipway just visible on the right in this photo. Stoba designed fishing smacks like Reliance and Surprise, pilot cutters like Louie Rigby and Kindly Light. 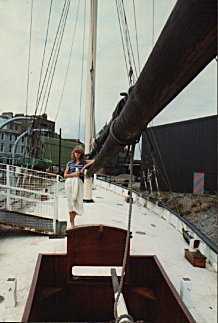 The pilot cutter, Kindly Light, built 1911, is seen here in dry dock in Cardiff Maritime Museum in 1983. 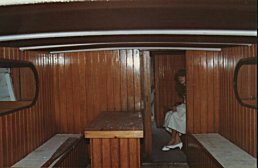 Although closed to the general public while being painted, James's great-grand-daughter, Margaret, was allowed on board and shown round the sleeping quarters and the galley. The Kindly Light was built by Armour Bros. for a Welshman, Lewis Alexander of Barry Island, S.Wales, who regularly stayed in Fleetwood watching her take shape, 52 ft overall with a beam of 14 ft 6 ins. 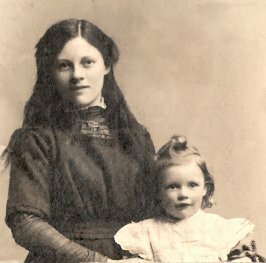 It was launched in November 1911 by James(3)'s eldest daughter, Elizabeth, always known as Bet Armour, who is seen in the picture here with her younger sister Barbara, a photo taken about that time. Kindly Light was built as a pilot cutter. Pilot cutters then could travel a good distance beyond Land's End to pilot ships into the Bristol Channel. Often it was the fastest boat that got the job, a point on which the Kindly Light scored high - and pay was rated on the size of the ship. Once near the ship the pilot would take a boy with him in a punt (a small boat) and go on board. The boy then took the punt back to the cutter. It was a difficult and dangerous operation in the dark or in rough seas. Sometimes the larger boat would tow the cutter back, though the crew, usually a man and a boy, disliked this as it was difficult to steer in the wake of the larger ship. 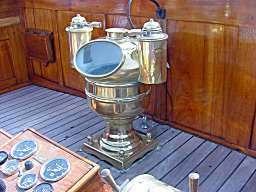 The Kindly Light has since been sold by the Museum at Cardiff and is now fitted out as a yacht and moored in Cornwall. James(1) and Ann did marry on 1 Jun 1838 but probably in Derry where presumably Ann also born. Nothing is known about her origins. James(1), arriving in Fleetwood from Londonderry in 1847 is frequently quoted as being the founder of the firm, but he died 5 years before it was founded in 1880! James(2) and his wife Elizabeth Gill did not have eleven children but four, of whom only three survived into adulthood. 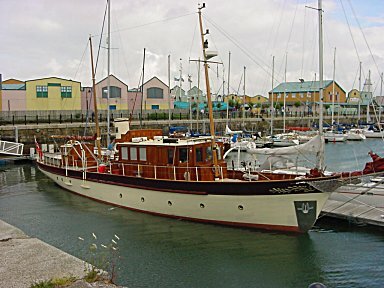 Kindly Light, built in 1911 by Armour Bros. as a pilot cutter to work in the Bristol Channel from Barry at a cost of £500 (a large sum in those days).. It was recognised as the fastest of its class. It was bought by Commander Linklater in 1922, renamed 'Theodora' and converted into a yacht. In 1955 it was sold to Mr St John Ellis of Eton who sailed 50,000 miles in it. In 1961 he lent it to the Ocean Youth Club as a training vessel. It was once 'towed into Great Yarmouth by the Gorleston life-boat after being in distress in the North Sea'. See Motor Boat and Yachting (edition of 26 Nov 1971) In 1956 it was awarded the Romola Cup by the Royal Cruising Club in the Tall Ships race, and was first home to Corunna when taking part in that race in 1958. In 1959 it sailed to America and Canada, crossing the Atlantic - both ways - in 20 days. 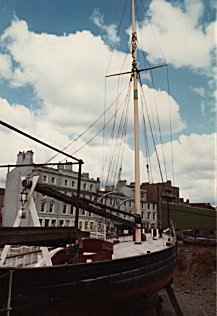 It was on display in Cardiff Maritime Museum from 1971 to 1993 but has now been sold again and is at present moored in Cornwall. Louie Rigby, (FD 127) a 76 ft Bermudan Ketch-rigged fishing smack built by Armour Bros. in 1911, launched by Mrs Andrews Her maiden name was Rigby and her father appears to have been Tom Rigby, a sail-maker and rigger who had come to Fleetwood from Freckleton in 1872 and built up a business in Adelaide St. 'Sister-ship to the Kindly Light' and also to Reliance and Surprise, she was designed for Brixham. The ship took part in the Coronation Regatta at Fleetwood on 24 June 1911, in the first race at 9 am, a handicap race for deep-sea fishing smacks. Also competing was Surprise (by Armours?) owned by W.Leadbetter as well as two others, Onward also owned by Mr W. and Harriet owned by Henry Leadbetter. Stoba himself was the starter for this race which was won by the Louie Rigby, the prize being £15. It was rebuilt in 1935 and 1958, with accommodation for 10 people, and renamed 'Captain Cap'. (Details can be found in Yachting World Jan.1974) In 1970 it was involved in rescuing an abandoned schooner off the Florida coast, towing it for 72 hours under sail. It was in dock in the West Indies in June 1973 and several pages of specification and detailed description were published with a photograph, in preparation for the sale. They are too long to quote here. It was still sailing as a yacht in 1974 under its original name, but the present whereabouts are unknown. Mauna Loa The spelling of this name is often erratic! It was named after the Hawaian volcano for which this is the accepted spelling and was built as an 84 ft steam yacht by Armour Bros for Mr Calvert of Fleetwood, used as a 'minesweeper' in the Mersey during the 1st world war, almost lost by neglect, then refitted as a luxury yacht. Since its sale in 2001 it has been renamed 'Ilona of Kylesku'. There was a scale half-model made of this boat but it is not known at present where it is. Minoru, 'Minoroo' (1909), built as a yacht, presumably from Armour Bros. yard, won the Blackpool and Fleetwood regattas a few times. Provider This boat, a 40 ft half-decker not mentioned above, which was thought to be by Armour Bros. in 1910 was actually registered on 19 February 1896 and was built by John Gibson & Sons as a 'centreboard fast sailer for the Mersey trade, for Peter Davidson of Tranmere', and 'launched on 25 February.' This is described as another of Stoba's innovative designs, enabling her 'to be the fastest half-decker out of Fleetwood for several years...The ballast keel of this fishing boat is unusual, and indicated Stoba's attention to detail. 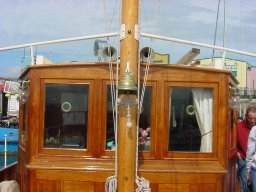 Most nobbys with outside ballast have "U" shaped ballast keels with hollow garboards, but Provider's ballast keel is "V" shaped under a wide structural keel. The other builders were able to use standard keel castings, but William Stoba will have had each keel cast specifically for the hull under construction. She was converted to a schooner yacht and was last known to be based at Barrow. Surprise (FD 122) (1908) a fishing smack (trawler), presumably from Armour Bros. yard. Walleroo, built by Armour Bros later and faster than Minaru (also built by Armour Bros), won all local races, Fleetwood to Douglas, Isle of Man, and the Royal Mersey Yacht Club's Liverpool to Douglas races. Zarah - another about which nothing is known at present except the name.